It is the custom of churches in the URC to celebrate Communion, on average, regularly, once a month and Prestbury and St Andrew's both follow this practice. The Church in Warden Hill, being a URC/Anglican Partnership has Communion more frequently, and the manner of the Communion varies. In the URC the Minister, assisted by a least two Elders, presides at the Communion, which is served to the congregation in their seats in the manner of a meal. The Bread is served first from a common plate and then small individual glasses of Wine are distributed. At Prestbury and Warden Hill URC Centre non-alchoholic wine is used, whereas at St Andrew's and St Christopher's it contains alchohol. We believe that all adults and children (if they so wish) should recieve Communion whether they are confirmed or not. 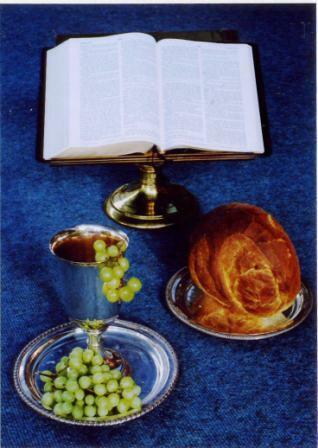 For times of Communion services please see the services page.